The US Census Bureau released on September 16 its 2014 report on “Health Insurance Coverage in the United States”. It provides the best estimate available on the share of the US population that is covered by health insurance, drawing on figures from both its Current Population Survey and its American Community Survey. The graph above was calculated from the underlying data used in the report (released by the Census Bureau along with it). The new figures confirm that Obamacare has succeeded in sharply reducing the number of Americans who must suffer from lack of health insurance. The results are consistent with those released earlier by other organizations, including from the commercial polling firm Gallup and from the non-profit Health Policy Center of the Urban Institute. But the Census Bureau results are derived from larger and more comprehensive surveys than a commercial outfit such as Gallup or a nonprofit such as the Urban Institute can mount. Gallup, the Urban Institute, and now the Census Bureau, have all found that health insurance coverage improved sharply in 2014, the first year in which the health insurance exchanges set up under Obamacare came into operation. Also important was the expansion from the start of 2014 of Medicaid coverage in 26 of the 51 states plus Washington, DC. The expansion, an integral part of the Obamacare reforms, raised eligibility from what had previously generally been 100% of the poverty line (there was some variation across states), to now include also the working close-to-poor who earn between 100% and 138% of the poverty line. Those earning more than 138% of the poverty line are eligible for federal subsidies (phased out with rising income) to purchase privately provided health insurance on the Obamacare market exchanges. The improvement in health insurance coverage in 2014 (the decrease in the share with no insurance) is clear from these multiple sources. And it should not be a surprise: The primary purpose of Affordable Care Act (aka Obamacare) was precisely to make affordable health insurance available to all. Yet prominent political figures opposed to the act (such as the Republican Speaker of the House John Boehner, and Florida Senator Marco Rubio, now a candidate seeking the Republican presidential nomination) claimed that the Affordable Care Act had actually increased the net number of uninsured. It was clear at the time that they did not understand some basics of insurance enrollment, and it is absolutely clear now that they were dramatically wrong in their assessments. But I am not aware that any of these political critics have had the courage to admit that they had in fact been wrong. There are some technical issues that arise in the Census Bureau numbers that should be understood, and these will be discussed below. But the basic numbers are clear. Between 2013, before the Obamacare exchanges were in operation, and 2014, there was a sharp reduction in the share of the American population who had no health insurance cover. This blog post will first review the basic results on improved health insurance cover with the start of the Obamacare reforms, and will then discuss some of the technical issues behind the numbers. 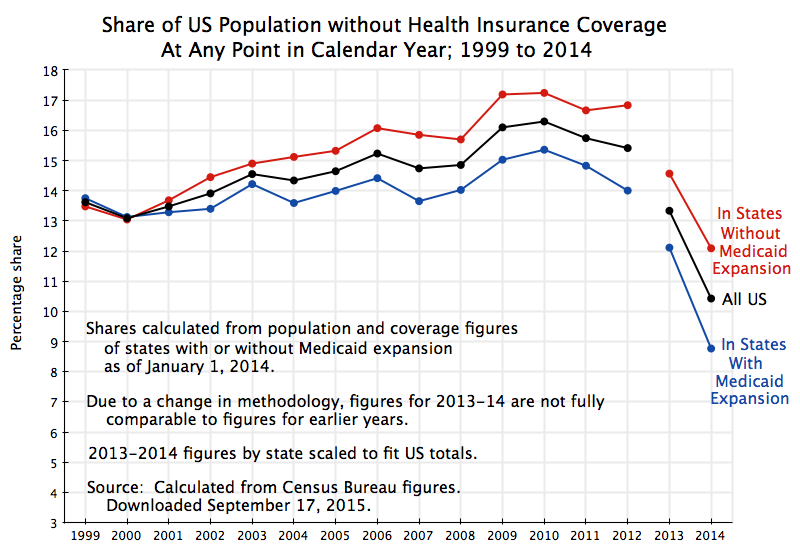 The graph at the top of this post shows the Census Bureau numbers, as percentage shares of the population with no health insurance over the period 1999 to 2014. Unfortunately (and as will be discussed further below), the Census Bureau changed its methodology in 2013, so the 2013 and 2014 figures are not directly comparable with the figures for 1999 to 2012. However, the 2013 and 2014 figures are directly comparable to each other, and show the sharp drop in the share of the population without health insurance in 2014 (the first year of the Obamacare market exchanges) compared to what it was before. The share of the population without health insurance cover at any point in the calendar year fell from 13.3% in 2013 to 10.4% in 2014. In terms of absolute numbers, the number of Americans without health insurance cover fell from 41.8 million in 2013 to 33.0 million in 2014, a reduction of 8.8 million or 21%. The number of Americans with health insurance cover rose by 11.6 million, with this number different from the reduction in the number with no insurance cover (the 8.8 million) because the overall US population is growing. Furthermore, this was not (as some politicians have charged) solely a result of the Medicaid expansion. While the Medicaid expansion was important, with an increase of 6.7 million enrolled in Medicaid (both under its prior program conditions, as well as under the expanded eligibility rules), the total number of Americans with some form of health insurance rose by well more than this. The chart also shows the shares without health insurance separately for the group of states that as of January 1, 2014, had chosen not to take the federal money to expand Medicaid coverage to include the working close-to-poor (those earning between 100% and 138% of the poverty line). Twenty-six states (all with a Republican governor or state legislature or usually both) decided not to expand Medicaid coverage to allow this segment of the population to obtain health insurance, despite the fact the additional costs would be covered 100% by the federal government for the first several years, with this then phased down to a still high 90% ultimately. Even at the 90% federal cost share, the net cost to the state would not simply be small, but in fact negative. Due to the higher state tax revenues that would be gained from what Medicaid would be paying hospitals, doctors, and nurses to provide health services to these close-to-poor, plus the lower state subsidies that would be needed at hospitals to cover a share of the cost of emergency room care that the uninsured must use when they have no alternative, the states would in fact come out ahead financially by accepting the Medicaid expansion. Yet for purely political reasons, the Republican governors and legislators in these states refused to permit this Medicaid expansion, leaving this segment of the population with no health insurance cover. It is also interesting to note from the chart at the top of this post that actions in this group of states to limit (or at least not facilitate access to) health insurance cover appear to have begun much earlier. The shares of the population without access to any health insurance cover in those 26 states which as of January 1, 2014, had chosen not to expand Medicaid coverage, are shown as the red line in the chart. The shares in the 25 states plus Washington, DC, that did decide to expand Medicaid coverage are shown in the blue line. In 1999 (the first year with comparable data in this series) and 2000, there was no such a discrepancy in health insurance cover between these two groups of states. Indeed, in 1999 a slightly smaller share of the population had no insurance cover in the red states than in the blue states. In 2000 the shares were almost identical. But this then changed. Starting in 2001, a consistent gap started to open up in the shares between the two groups of states, with fewer covered by insurance in the red states than in the blue. The overall national trend for the share of those with no insurance cover was also upwards. Why the gap between the two groups of states started to open up in 2001 and remain to this day is not fully clear, but it may reflect the trend to more conservative politics that started at that point (including the start of the Bush administration in 2001). The refusal to accept the Medicaid expansion (even at a cost to themselves), and other measures aimed at blocking Obamacare or at least make access more difficult (such as refusal to operate market exchanges at the state level), is in keeping with the observed deterioration in access to health cover in these states well prior to Obamacare ever being debated. Estimates of the share of the population with or without health insurance cover come from surveys, and thus have the strengths and weaknesses of any surveys. The accuracy of the results will depend on how well those being surveyed recall and answer correctly what they were asked. The results will often depend on the way the questions are worded, and sometimes even on the sequence in which the questions are asked. The Census Bureau recognizes this, continually tests its questionnaires, and periodically will change the way they ask their questions in a survey in an effort to obtain more accurate results. Unfortunately, when there is such a change the new survey results will not be strictly and directly comparable with the responses provided in the past. Often the Census Bureau will use various methods to try to link the different data series into one consistent whole, but this is not always done. One way to do this, for example, would be to conduct two parallel surveys when there is to be a change, one following the old method and one following the new, and then with statistical methods to control for sample characteristics, seek to determine by how much the old series would likely need to be adjusted to become consistent with the new. The Census Bureau did this when methodological changes were made in the series tracking health insurance coverage in 2007 and again in 2011. When the 2007 changes were made, they went back and adjusted figures from 1999 onwards to approximate what they would be following the 2007 approach. And when the 2011 changes were made, they again went back, to 1999 again, to produce a consistent series that eventually covered the period 1999 to 2012. However, when the changes implemented in 2013 were made, the Census Bureau did not go back to adjust previous figures for consistency with the new approach. I have found no explanation for why they have not, but would guess it might well be linked to budget cuts. But for this reason, one cannot assume that the figures showing a reduced share of the population without health insurance in the 2013 figures compared to those in 2012, are necessarily due to more people enrolling in health insurance in 2013 relative to 2012. Hence the gaps in the lines in the graph as drawn above. Indeed, other evidence suggests that coverage in 2013 was similar to that in 2012. Specifically, the Gallup numbers previously cited indicate that share of uninsured in 2013 was actually a bit higher than where they were in 2012 (averaging what are quarterly estimates). There was then a sharp fall in 2014 in the Gallup figures following the start of the Obamacare exchanges and the Medicaid expansion, consistent with the Census Bureau numbers. It is unfortunate the Census Bureau did not try to work out a consistent series of estimates for health insurance coverage for this critical period. But for whatever reason they did not (at least not yet). But what we do know from the Census figures is that the share of the uninsured in the population was trending upwards over the 1999 to 2012 period, and that there was a sharp reduction in the share uninsured in 2014 compared to what it was in 2013. And that is therefore all we could work with in this post. Another issue is that the state by state figures were determined by the Census Bureau under one survey for the 1999 to 2012 period (the Annual Social and Economic Supplement to its Current Population Survey, or CPS-ASEC), but then a different survey for 2013 and 2014 (the American Community Survey, or ACS). Both are large surveys, asking questions on a variety of issues. But they ask somewhat different questions on the issue of health insurance coverage. Specifically, the CPS-ASEC, which is undertaken between February and April of each year, asks the respondents whether they had had health insurance coverage at any point in the previous calendar year (separately for each household member). The ACS survey, in contrast, is undertaken on a rolling basis throughout the year, and the question asked in that survey is whether each household member had health insurance cover at the time they were being interviewed. These are of course different questions. And by simple arithmetic, it should be clear that the responses to whether they had insurance at any point in the year will, for the sample as a whole, always be a higher figure than the share in response to the question of whether they have health insurance at the time of the interview. Someone might not have health insurance at the time of the interview, but could have had it earlier in the year (or will obtain it later in the year). The shares uninsured will be the mirror images of this. The figures in the graph at the top of this post are based on the estimates of coverage at any point in the calendar year. There was, however, a problem in determining on a consistent basis the underlying state figures, from which one could compute the shares for the states that had expanded Medicaid coverage and for those who had not. The figures at the state level that the Census Bureau made available on its web site for the 1999 to 2012 period were from the CPS-ASEC series. However, for some unexplained reason, but as part of the changes introduced with the new 2013 numbers, the state level figures for 2013 and 2014 were only made available under the ACS series. I do not know why they did this, as it introduces another element of inconsistency when making comparisons across time. Since the bulk of the state level series, for 1999 through to 2012, were published under the CPS-ASEC series, I used those as published. But for 2013 and 2014, I determined the state totals for the Medicaid expansion and Medicaid non-expansion groups based on the ACS numbers (as they were the only ones available), and then rescaled the figures to fit the published national totals (working in terms of the underlying numbers, and then computing the shares). The figures should be very close to what would have been worked out directly from the CPS-ASEC figures if they had been made available at the state level. One would expect the ratio of the figures of those without health insurance under the two different definitions (throughout the year or at the time of the interview) would not differ significantly between the two groups of states (those with and without the Medicaid expansion). Technical issues exist with any data set, and it is important to recognize what limitations such issues place on what one can infer from the figures. Unfortunately, the Census Bureau numbers as published do not permit us to compare directly the 2013 and 2014 results to those of 1999 to 2012. However, the 2013 and 2014 results are directly comparable to each other, and they clearly show that there has been a major improvement in health insurance coverage in 2014 after the Obamacare exchanges and Medicaid expansion came into effect. This entry was posted in Health Reform and tagged health reform, Obama, policy, US politics by aneconomicsense. Bookmark the permalink.